I’m working on my race recap for the Jax Tri Series race #3 that happened last weekend. I could make it very simple by saying it didn’t go as well as the previous one, but definitely wasn’t my worst race ever! Writing up those race recaps always takes me longer than I think it will. My goal is to have it up on Friday, but I’ll be more realistic and say that it will be up before Monday. As per usual lately, when I sat down I had no idea what I was going to write about but being as this is supposed to be a thoughtless post, I went straight to my pictures. I was going to just share the most recent randomness captured on my iPhone (just to show how little my brain is functioning properly I just typed ‘eye phone’ and had to delete it) but then I browsed back through the last 12 months in my iPhoto. These are some of the first pictures meaning they are from one year ago. One year ago I ran my first postpartum race. Brice was 6 1/2 months old at the time and Colin ran the race with me. He pushed Brice so that I wouldn’t have anything slowing me down. It started raining with a little more than half a mile to go so I told Colin to go on ahead to get Brice out of the rain. I finished in 26:30 and could not have been any more proud of myself!! That was my fastest 5k road race to date. In less than a year I have knocked another 3 minutes and 12 seconds off of my time. I never imagined I would be running the times I am today, but it just shows that a year full of hard work really does pay off. 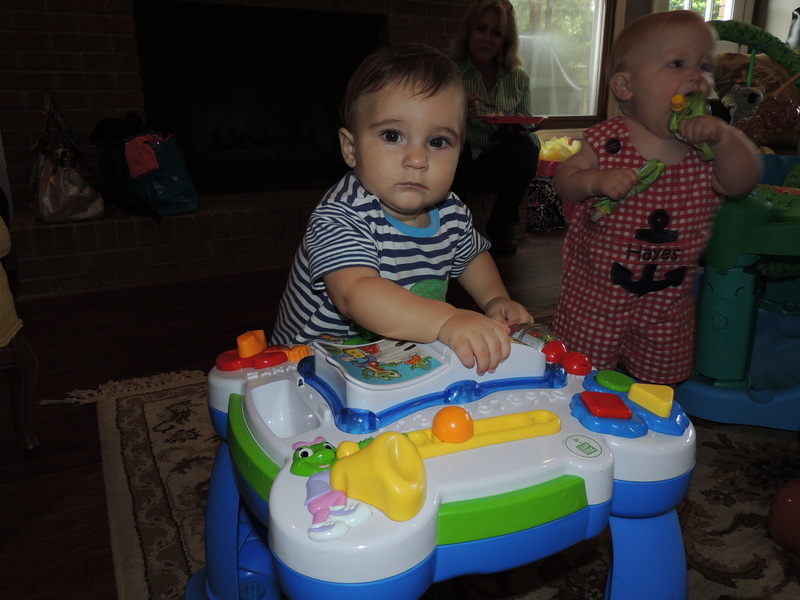 One year ago we were celebrating our friend’s son, and Brice’s buddy, 1st birthday party! Today he turns two and this weekend we will be celebrating his 2nd birthday!! I am still having a hard time believing that sweet boy is 2. It’s been so much fun to watch the two of them grow up together, and I know theses boys are going to be causing their mama’s a lot of stress as they get older! 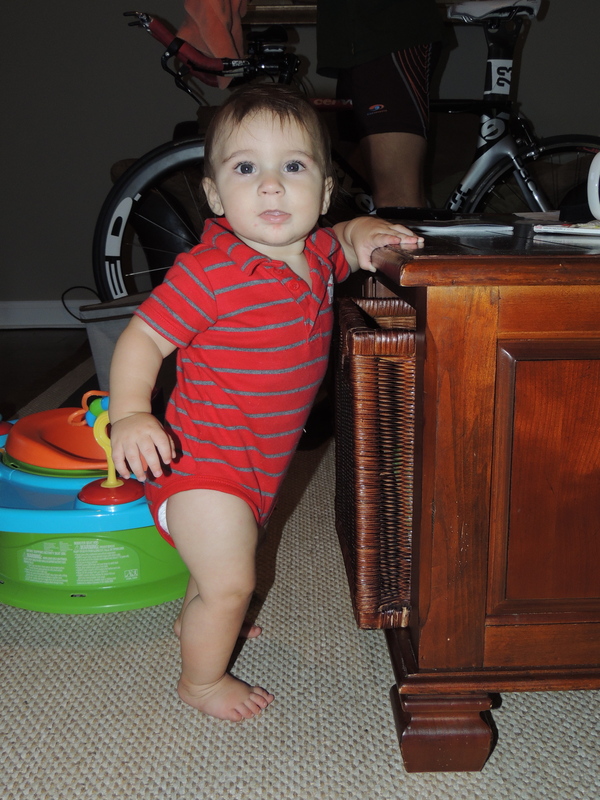 One year ago, this wild man wasn’t yet walking. He was pulling up on everything he could get to but we were still able to keep up with him. As you can see from the background, some things never change! 🙂 Colin on the indoor trainer. 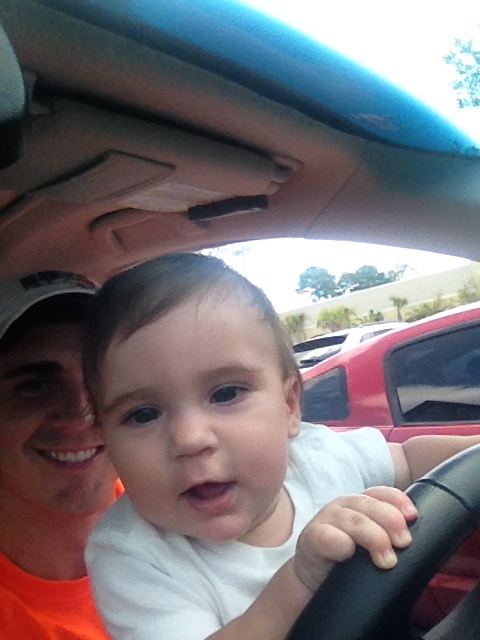 One year ago, Brice was already obsessed with trying to drive. Some days we have to drag him out of the car because he doesn’t want to stop ‘driving’! Where were you 1 year ago?? What is the biggest change you’ve had in the last year? I say this every time, but I want to be your child and I want Bryce to be my brother. He is insanely cute and such a personality. 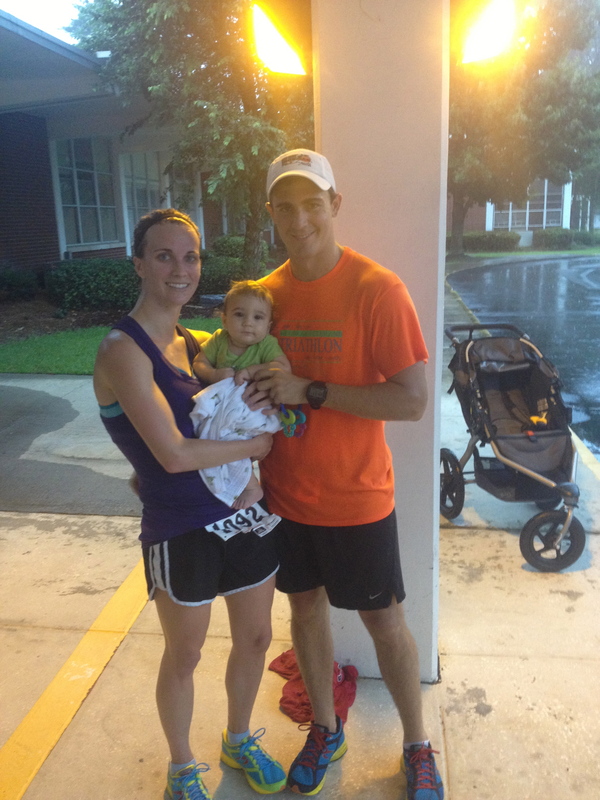 I can’t imagine what it will be like to run, much less race, after having a baby. Having the child itself is going to be such a production for my body, anyway, that it will be a marathon in and of itself! I would say that the biggest change in the past year has been finding happiness with my job situation. It has really turned me around. He really does have the funniest personality and it’s just getting better by the day! Fortunately, I didn’t notice many physical changes in running after having Brice. More than anything it made me realize just what my body is capable of! I hope your body surprises you and thrives from a pregnancy!! Happiness in your job is huge being that is where most people spend the majority of the day. I’m glad you have found that happiness!! Great post B. And dang…killing the 5k time! Ummmm…too much has happened since a year ago. Let’s just say I’m better off now than where I was 1 year ago. Thanks! It’s crazy what our bodies are capable of when you push them. It’s always good to be moving forward and I hope you are in an even better position one year from now! Are you running the Savannah RnR? I’m debating on it, but haven’t made a decision yet…it’s my birthday weekend, so I’m torn. I’m running the half! It’s an excuse to get to go home plus Philip Phillips is the after race concert. 🙂 I’m going to be working at the expo with Sparkly Soul and they are looking for one other person to work so let me know if you or anyone you know is running and would be interested! Wow! You are a super mom! That 5k time is impressive! SOOO much has happened in 1 year! You are too sweet! As you know, when you watch your baby grow, one year goes by WAY too fast!! What a cute post – I love looking back to a year ago and seeing what you were doing and where you were in your life. One year ago I was working on my health coaching certification and schooling and wondering if we were able to get pregnant following a miscarriage. Some things have changed a lot and others just seem to remind me that I am on the right path. I’m sorry to hear about the miscarriage. It’s crazy how much can change in a year, and I know the next year for you is going to be very exciting! !